Thirty years ago, the primary source of kosher products for numerous communities in the region began with a pizza party. Brown grew up in a kosher Conservative home in New Orleans. He attended Lakeshore Hebrew Day School, and when he was 12 the family decided to become a bit more traditional. “My father was a foodie and had built a beautiful kitchen,” Brown said. At that moment, “a light bulb went off,” so he found a kosher pizzeria in Miami and called them with an order for 150 pizzas. “They hung up on me,” Brown said, thinking it was a practical joke. After some convincing that he was for real, a supply of pizzas arrived via Delta Air Freight. By the time they arrived, he had pre-sold every pizza. The idea of providing kosher items to the New Orleans community was planted. He started small, storing items in his mother’s chest freezers. After about six months, he started contemplating a retail launch “on the side,” as he was working in food services at a hospital. A few weeks later, he turned the electricity back on and gave it a try. Around then, he met and started dating Natalie, who would become his wife. She was interested in helping build the business “and we really worked side by side all the way through,” until she died from breast cancer in 2011. As the grocery business expanded, so did the deli, and space “started to get really tight” in the building on North Hullen. In 1999, he bought the property on the Severn Street side and started a major expansion. When it opened in 2000, there was an additional 5,000 square feet, with groceries on the North Hullen side, a new large kitchen, expanded dining area that can seat 80, a kosher wine section with 150 varieties from around the world and a Judaica shop. It’s also the Jewish New Orleans welcome center. As New Orleans continued to grow as a major convention city, the number of visitors who keep kosher has continued to expand. Now, “it is every day” that Kosher Cajun is called upon to serve out-of-towners. Early on, the visitors said they would love to have some New Orleans dishes. Though Kosher Cajun was a New York style deli, “we wanted to stand up to our name and offer real New Orleans kosher specialties, like kosher fried ‘shrimp,’ jambalaya, chicken and sausage okra gumbo, red beans and rice.” They also do kosher pareve king cakes. New Orleans is “the mecca of food with amazing restaurants,” Brown said, but kosher visitors hadn’t been able to take advantage of that. When a meeting or event is held at a restaurant, those who keep kosher could feel left out. Enter Kosher Cajun. They provide double-wrapped meals that can be heated in a non-kosher oven at any restaurant or hotel, and the meals are served on real china with real flatware, not plastic. “We’ll bring one meal, we’ll bring 100 meals,” Brown said, noting the meals have been served at “all the fine restaurants,” the National World War II Museum, Mardi Gras World, the Superdome, the Convention Center. As the china does not come back into the store after being used at the non-kosher venue, “we buy china by the pallet.” A typical week could see 1,000 such meals prepared. With New Orleans serving as a major cruise ship terminal, Kosher Cajun has worked with the cruise lines to serve kosher passengers. But Kosher Cajun isn’t just serving kosher consumers — they do Halal meals, gluten-free, vegetarian and vegan. Brown explained that when big caterers are serving 1,000 people, they don’t want to have to bother with the specialty meals, so they call Kosher Cajun. 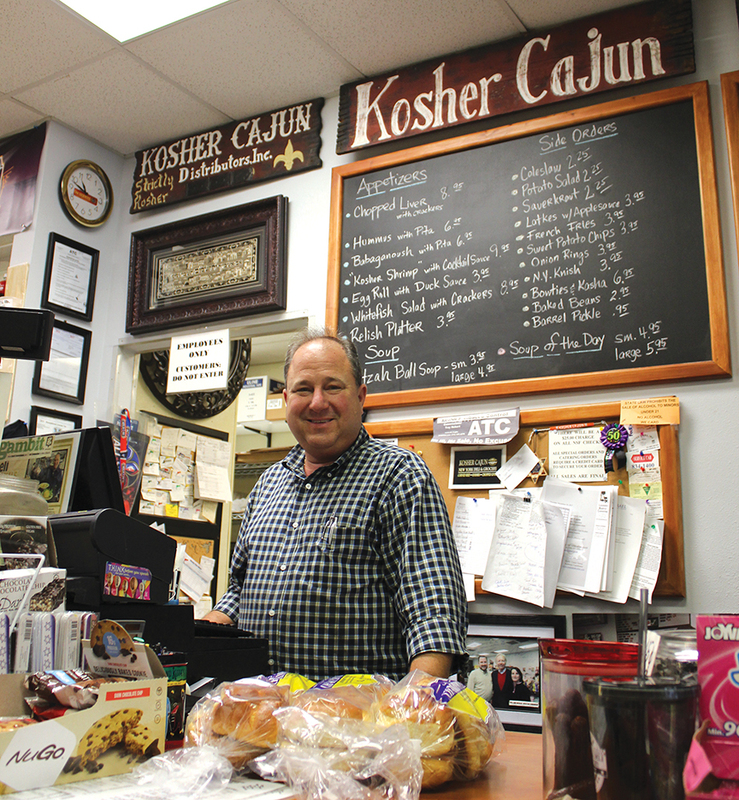 Kosher Cajun also serves as a kosher resource for the region. Packages can be sent same-day by Greyhound bus to locations in Alabama, Mississippi, Louisiana, “all the way to Pensacola.” Those further out can order for FedEx shipping, and he has filled orders as far as Hawaii. Even in Memphis, which has a decent kosher selection and a large Orthodox community, “they are always looking for more variety,” so he heads there with a refrigerated truck. Kosher Cajun also serves as a kosher product distributor for mainstream grocery stores in the area who want to expand their ethnic offerings, and supplies products to a halal establishment. They also provide catering for kosher events, including platters of latkes for community Chanukah celebrations, and catered the Seder for Chabad of the Emerald Coast in Destin. When Huntington Ingalls Industries in Pascagoula was building three Sa’ar-5 ships for Israel’s Navy, Kosher Cajun fed the 50 Israeli soldiers stationed there, bringing a standing order every week. When it was time for the ships to head out for Israel, they had to provide enough food for the three-week trip. When they pulled up, carrying the huge order and Israeli items “that they longed for,” it was like seeing kids chase an ice cream truck, he said. He got a tour of the ships, and insignia from the uniforms hangs in the store. 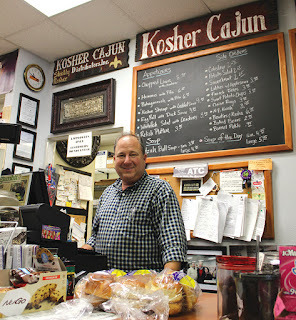 Kosher Cajun’s vital role in the community was underscored after the levees broke following Hurricane Katrina. There had been four inches of water in the store, but the lack of electricity and the heat meant Brown was greeted with an overpowering stench from rotting meat and chicken, and black mold on the walls. It wasn’t just the locals — Jewish groups from around the country flocked to New Orleans to help rebuild the city, and they needed kosher meals. Brown said there are still schools that send groups to New Orleans as “a regular part of their curriculum” to learn about the storm and its aftermath. But the biggest benefit, Brown said, is community. Those visiting from elsewhere start off by asking him to tell them about the New Orleans Jewish community. Visitors will often bring regards from someone else who visited one year or 10 years earlier. Through this, Brown has become an expert in Jewish geography.